To be someone in a sea of people. Because it is of the Portuguese, father of broad seas, to want, to be able to simply: be nothing. And be someone in a sea of people. Be a person. Flood. Dry out. Cry. Float. Come up and dive in again. Be fished. Be gutted and survive. The whole sea, or the empty destroyed waterfront – The whole, or its nothing. The deserved tribute to Fernando Pessoa, in a decorative piece with a design of excellence! The sardines are made with high quality colors and decals, which allows them to have a very strong, intense and beautifull glow and color. All the decorating process in each sardine is manual. The decoration is performed by decal process, which takes on average 10 minutes, producing only a few per day. Each Bordallian sardine is wrapped in a original packaging to simulate a sheet of newspaper, in a throwback to the tradition of the sale of this fish in Lisbon, dating back to the XVIII century, between typical selling sayings, from the fishmongers. It results from the collaboration between the Ceramic Factory in Caldas da Rainha (Fábrica de Faianças), founded in 1884 by Raphael Bordallo Pinheiro and EGEAC. 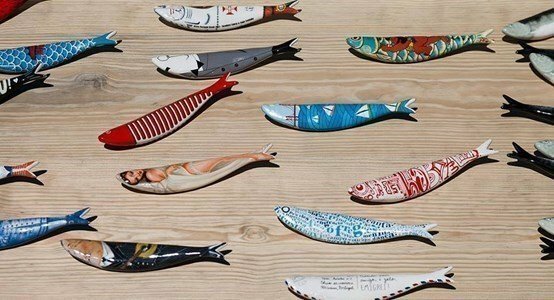 The sardines produced in ceramic, created from the selected drawings of a vast existing heritage, joining in the original sardine from Raphael Bordallo Pinheiro.